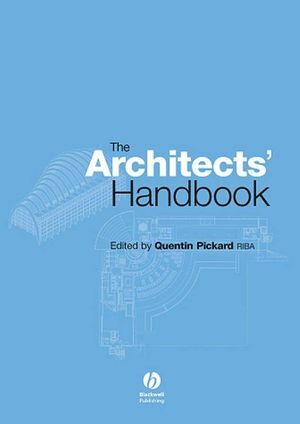 The Architects' Handbook provides a comprehensive range of visual and technical information covering the great majority of building types likely to be encountered by architects, designers, building surveyors and others involved in the construction industry. It is organised by building type and concentrates very much on practical examples. The book also includes sections on designing for accessibility, drawing practice, and metric and imperial conversion tables. Quentin Pickard, BA, RIBA, MiMgt, studied architecture at Newcastle University and Thames Polytechnic and qualified in 1976. After working for Haringey Council he established a practice in 1978 with a colleague, specializing in ecclesiastical and conservation projects. He has been the Inspecting Architect for several churches in north and central London. He is currently working for the Methodist Church Property Office. Quentin comes from a publishing family and has contributed both artwork and the written word to several books. He has been chair of the Aqua Group since 1989 and has been closely involved with several recent editions of three of the Group’s books (Pre-Contract Practice, Contract Administration, and Tenders and Contracts for Building, all published by Blackwell Publishing). He is the RIBA Conservation Advisor and has commented on numerous consultation documents and has taken part in several radio interviews. He set up the RIBA London Region Conservation Group, and he has helped to establish the national Register of Architects Accredited in Building Conservation. Quentin teaches on the Architectural Association Professional Practice Part 3 course, on the subject of building contracts. For several years he led building conservation teaching at South Bank University, as well as lecturing in architectural history, design and drawing practice. He has also lectured at several other universities and colleges, mainly in London. He has always believed strongly in the need for greater co-operation within the construction industry, and he was chair of the Junior Liaison Organisation in 1984. He is a member of ICOMOS and a freeman of the Worshipful Company of Chartered Architects. Education: Art, Design and Media Studios. Halls of Residence and Hostels. Libraries and Learning Resource Centres. "All too often, architects attempt to redesign the wheel. Why struggle to sort out the complexity of a modern building when you can learn from the great masters. If the best architects in the world have visited the problems before, the chances are they have something to teach us. This book, with its detailed information about ground breaking buildings, should change the way we assimilate practical technical information"